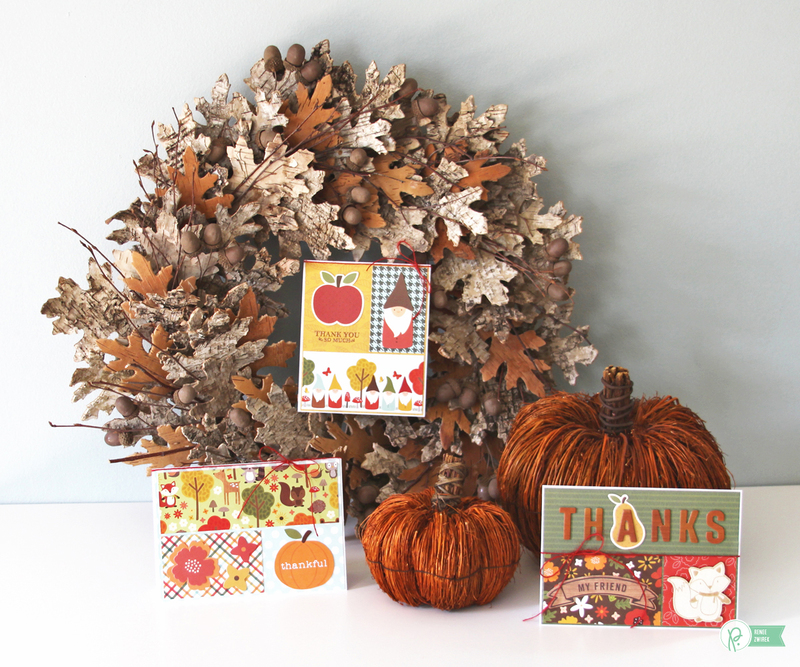 Fall Thank You Cards - Pebbles, Inc.
Hello! 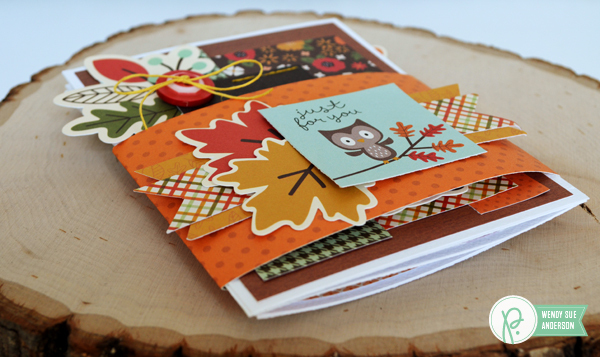 Renee here today to share a few fall Thank You cards I made using the Woodland Forest collection. I love this fall collection! 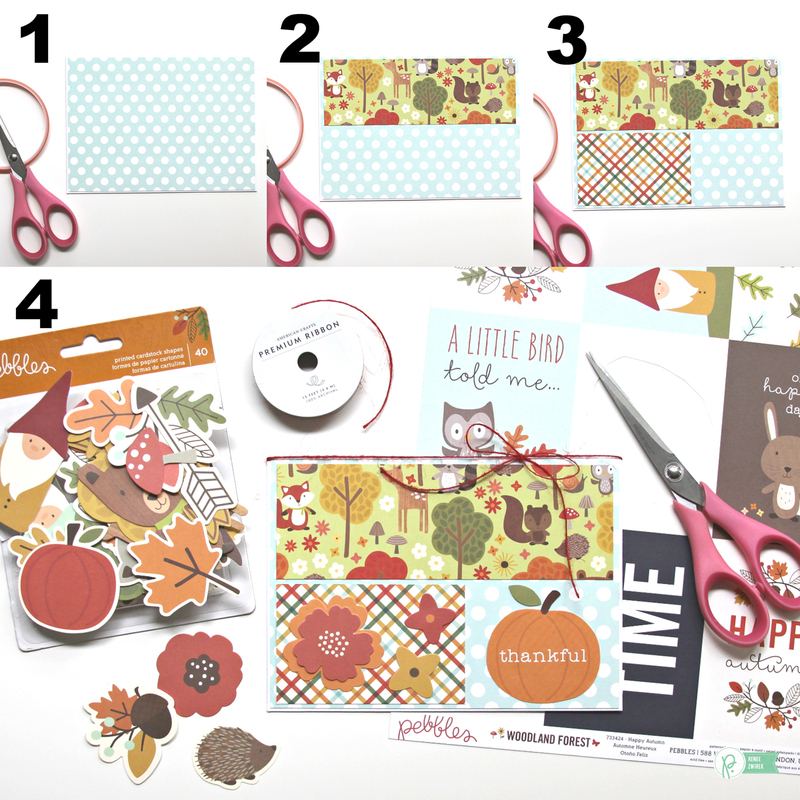 It has great colors, adorable little critters and other reminders of the season, and most of all…fun fall patterns. I thought it would be fun to add blocks of pattern papers to create these cards. I started with white Cardstock trimmed and folded to a 5″ x 7″ card. I trimmed the Pears pattern paper to 4 ¾” x 6 ¾ ” and adhered it to my card base. I trimmed the Fall Florals pattern paper to 2 ½” x 4 1/8″ and adhered it near the bottom left corner of my card. I trimmed the Stitched Floral pattern paper to 2 ½” x 2 ½” and adhered it near the bottom right corner of my card. For embellishments, I adhered an adorable Wood Veneer raccoon to the bottom right block of my card. I added a “my friend” banner Die-Cut to the bottom left block of my card. 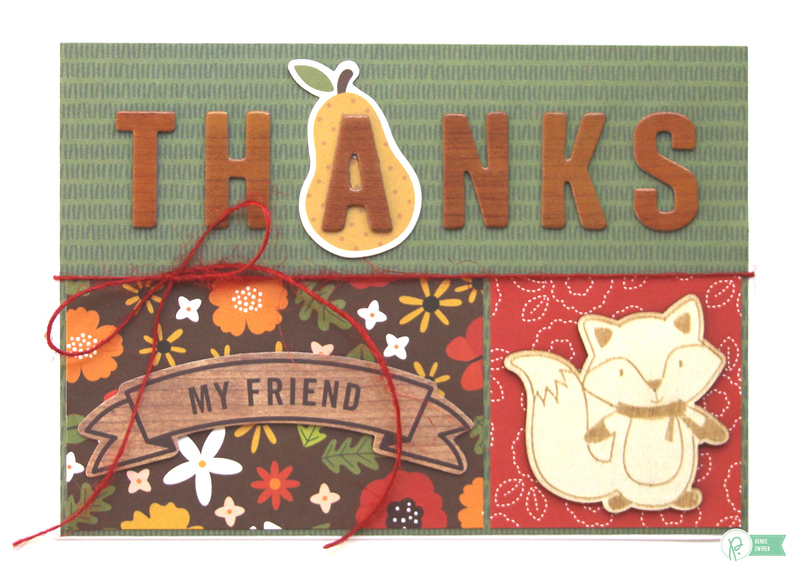 I used the Friends Thickers for the sentiment of my card along with a pear Die-Cut underneath the letter “A”. I finished off the card with some red Hemp Twine. I started with white Cardstock trimmed and folded to a 5″ x 6″ card. 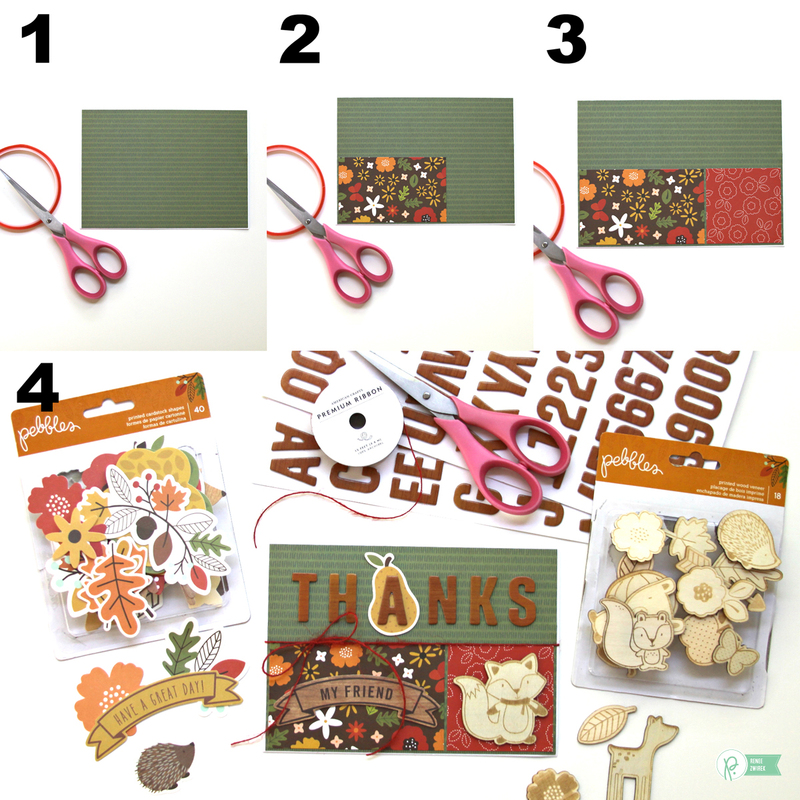 I trimmed the Fall Florals pattern paper to 4 7/8″ x 5 7/8″” and adhered it to my card base. I trimmed the Gnome Home pattern paper to 2 ¼” x 4 ¾” and adhered it near the bottom of my card. I trimmed the Autumn Day pattern paper to 2 1/8″ x 3 3/8″ and adhered it near the top right corner of my card. For embellishments, I adhered a gnome Die-Cut to the top right block of my card. I adhered an apple Die-Cut to the top left block of my card. I heat embossed the sentiment of my card below the apple die-cut. I finished off the card with some more red Hemp Twine. I started with white Cardstock trimmed and folded to a 5″ x 7″ card. 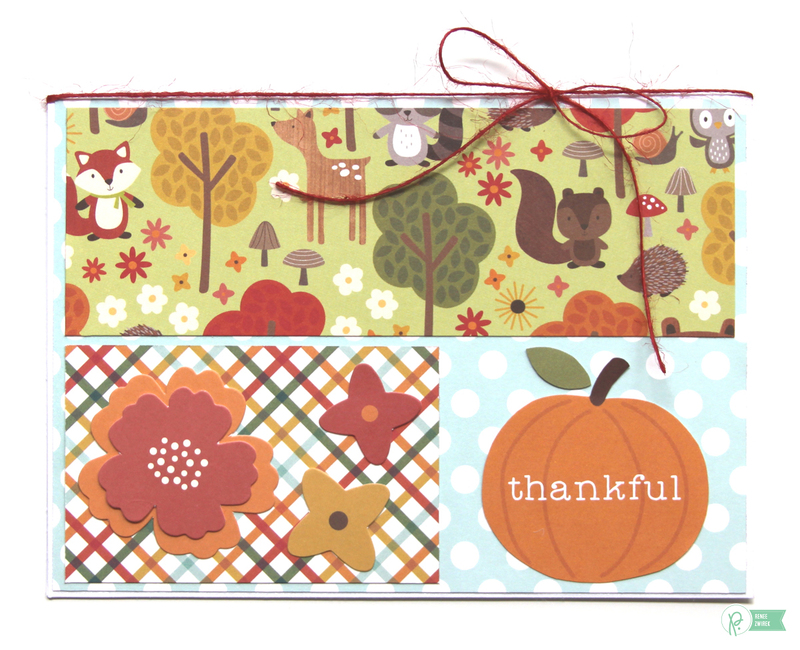 I trimmed the Thankful pattern paper to 4 ¾” x 6 ¾ ” and adhered it to my card base. I trimmed the Woodland Forest pattern paper to 2 ¼” x 6 5/8″ and adhered it near the top of my card. 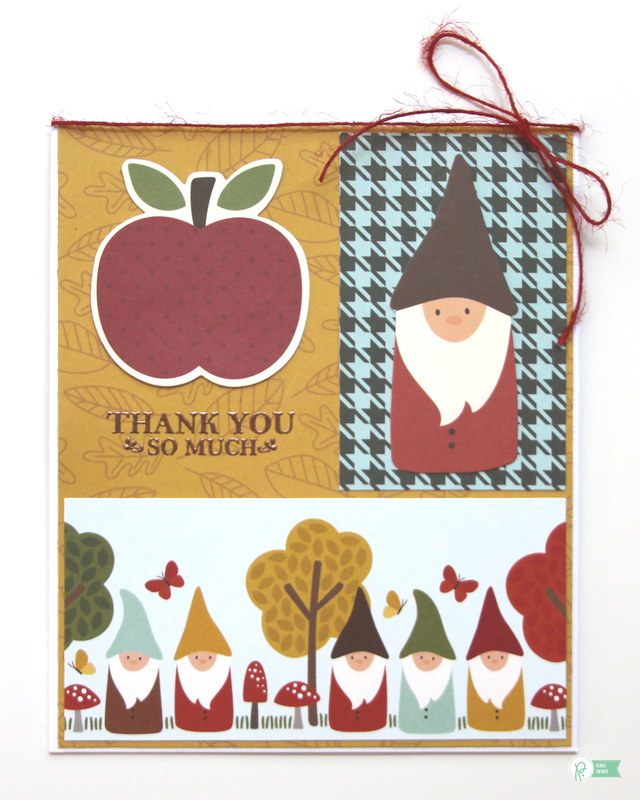 I trimmed the Gnome Home pattern paper to 2 3/8″ x 3 5/8″ and adhered it near the bottom left corner of my card. 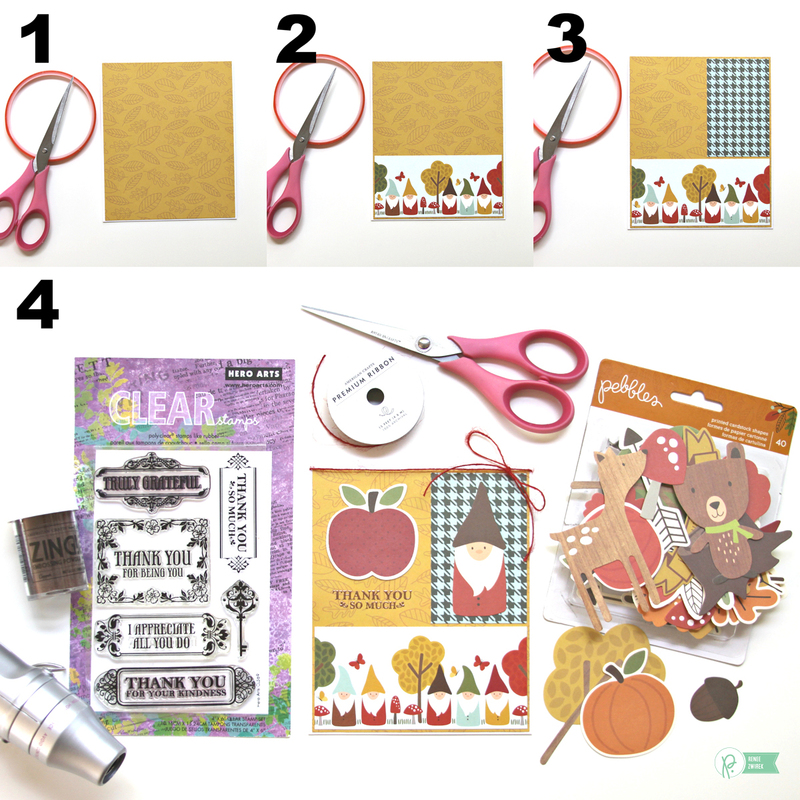 For embellishments, I fussy cut a “thankful” pumpkin from the Happy Autumn pattern paper and adhered it to the bottom right block of my card. I added a few flower Die-Cuts to the bottom left block of my card and finished it off with the red Hemp Twine. I hope you enjoyed my Fall Thank You Cards! For more card inspiration using the adorable Woodland Forest collection, check out Wendy Sue’s Birthday Card Set. Thanks for stopping by the Pebbles blog today! Happy Creating!